The Gtk.Stack widget is a container which only shows one of its children at a time. In contrast to Gtk.Notebook, Gtk.Stack does not provide a means for users to change the visible child. Instead, the Gtk.StackSwitcher widget can be used with Gtk.Stack to provide this functionality. Transitions between pages can be animated as slides or fades. This can be controlled with Gtk.Stack.set_transition_type(). These animations respect the Gtk.Settings :gtk-enable-animations setting. The Gtk.Stack widget was added in GTK+ 3.10. Gtk.Stack has a single CSS node named stack. Creates a new Gtk.Stack container. Adds a child to self . The child is identified by the name . Adds a child to self . The child is identified by the name . The title will be used by Gtk.StackSwitcher to represent child in a tab bar, so it should be short. Finds the child of the Gtk.Stack with the name given as the argument. Returns None if there is no child with this name. whether self is horizontally homogeneous. Gets whether self is horizontally homogeneous. See Gtk.Stack.set_hhomogeneous(). Gets whether self is homogeneous. See Gtk.Stack.set_homogeneous(). 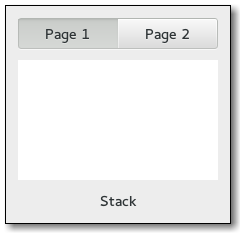 Returns wether the Gtk.Stack is set up to interpolate between the sizes of children on page switch. Returns the amount of time (in milliseconds) that transitions between pages in self will take. Returns whether the self is currently in a transition from one page to another. Gets the type of animation that will be used for transitions between pages in self . whether self is vertically homogeneous. Gets whether self is vertically homogeneous. See Gtk.Stack.set_vhomogeneous(). Gets the currently visible child of self , or None if there are no visible children. Returns the name of the currently visible child of self , or None if there is no visible child. Sets the Gtk.Stack to be horizontally homogeneous or not. If it is homogeneous, the Gtk.Stack will request the same width for all its children. If it isn’t, the stack may change width when a different child becomes visible. Sets the Gtk.Stack to be homogeneous or not. If it is homogeneous, the Gtk.Stack will request the same size for all its children. If it isn’t, the stack may change size when a different child becomes visible. Since 3.16, homogeneity can be controlled separately for horizontal and vertical size, with the Gtk.Stack :hhomogeneous and Gtk.Stack :vhomogeneous. Sets whether or not self will interpolate its size when changing the visible child. If the Gtk.Stack :interpolate-size property is set to True, self will interpolate its size between the current one and the one it’ll take after changing the visible child, according to the set transition duration. Sets the duration that transitions between pages in self will take. Sets the type of animation that will be used for transitions between pages in self . Available types include various kinds of fades and slides. Sets the Gtk.Stack to be vertically homogeneous or not. If it is homogeneous, the Gtk.Stack will request the same height for all its children. If it isn’t, the stack may change height when a different child becomes visible. Makes child the visible child of self . If child is different from the currently visible child, the transition between the two will be animated with the current transition type of self . Note that the child widget has to be visible itself (see Gtk.Widget.show()) in order to become the visible child of self .